Can a planet affect people before it’s been discovered ? This has long been an issue of debate amongst astrologers. One simple way of looking at it is that humans are affected by the planets whether they’re aware of it or not so mankind’s discovery of a planet would not alter the fact that it’s always been there and was therefore always influencing human behaviour. On the other hand astrology has existed and worked well for thousands of years and only in the last 240 years have Uranus, Neptune and Pluto been discovered. The planets that can be seen with the naked eye ( as far as Saturn ) were seen to amply cover the whole of human experience. Uranus, Neptune and Pluto are all planets associated with change and revolution and it is said by some astrologers that their discovery allowed and enabled humans to experience this type of transforming energy which previously wasn’t available to them. It is possible, however, that although an event could’ve been predicted and understood by the transits of the planets that people were aware of at the time, the understanding of that event might be improved by looking at the positions of planets yet to be discovered. One very interesting case would be that of Henry VIII. 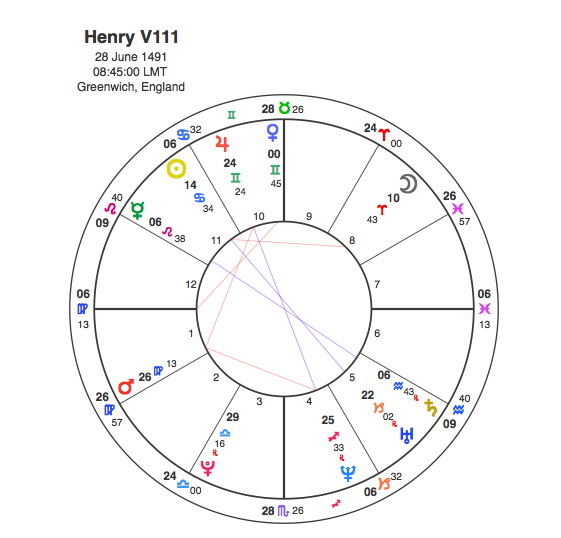 Henry had the Sun at 14 degrees Cancer in the 11th house in square aspect to an Aries Moon in the eighth house. Henry as we know had six wives, two he killed, two were divorced, one died and one lived after him. It is not surprising that Henry has the Moon in Aries in the eighth house as he clearly had a impatient and impetuous way of getting rid of his various wives. The Moon being square to the Sun might well be enough to explain this, however it would be more interesting if there had been a planet in the fifth house of children in Henry’s chart. We know now that Uranus was in the 5th house opposite his Sun and therefore forming a widish T-square to the Moon in the 8th. So we have Henry’s aims and ambitions for his dynasty ( Sun in the family oriented Cancer in the 11th ) is thwarted by Uranus in the 5th. Uranus in opposition to the sun is often disruptive as it tends to bring unpredictability to areas in the life that one would assume to be naturally smooth, so in the 5th house opposite the eleventh we are looking at problems bearing children. When we see Uranus in this position particularly as the opposition creates a focal T-square to the Moon in the 8th the whole thing becomes clear. Henry’s attempts to preserve his dynasty would be upset by unpredictable and disruptive circumstances so his response to that was to get rid of his wives. In order to get rid of his first wife Catherine of Aragon Henry had to annul the marriage and to do that he had to separate from the church of Rome and establish himself as head of the Church in England. In 1533 Henry, who had been having an affair with Anne Boleyn, found that she was expecting a child. His response as we know was to set up the Church of England, divorce Catherine and marry Anne. In Henry’s chart, Saturn was transiting conjunct his Sun and square his Moon in 1533 which would’ve been enough for astrologers of the day to come to an understanding of the situation. Of course at the time this seemed like a desperately dangerous thing to do cutting the country off from the church of Rome and risking mass excommunication. The whole country would have been very worried about their spiritual condition and future and any astrologer would have said that Saturn being on Henry’s Sun would cause all kinds of catastrophe although he probably would not have said that in front of Henry. We now know that whilst Saturn was conjunct Henry ‘s Sun in May 1533 but Uranus was as well. Uranus’ transit shows the truly radical step the break from Rome would have not only on Henry but on the country as a whole. It is seen as one of the great revolutionary moments in history. If we view this moment just as a Saturn transit we don’t get the whole picture but we do get the view as it was perceived by the people who lived at that time. Uranus is all about breaking down old barriers of authority and starting something new. But to people at the time who had no understanding of Uranus and its principle it would simply seem like jumping over the edge into a Saturnian abyss. Uranus was operating here both in Henry’s chart and in the events of 1533. In fact such a major historical turning point would have required the conjunction of two of the slower moving planets Saturn and Uranus. Obviously Uranus was not discovered for another 200 years but it was clearly at work here. Very interesting. Perhaps the then unknown Pluto also says something about him: it is in his 3rd house, which symbolises the transformation brought about by the death of his older brother Arthur, which made Henry the sole heir to the throne (Pluto is trine Jupiter in the 10th). Hello CCapricorn! Thank you for all your articles. I like them very much. I am very interested in how did astrologers percieved in ancient times, therefore i would like to understand more about Saturn ruling Aquarius, Mars ruling Scorpio, and Jupiter ruling Pisces. How was it when astrologers did not know about Uranus, Neptune, and Pluto? How were those signs percieved and explained in those days? Thanks very much! Thanks very much for your reply, CCapricorn! Can you tell me more about the aspects of ancient rulership which we can ascribe even nowadays? I am accostumed to see Scorpio, Aquarius, and Pisces through their modern rulers. Can you tell me anything about the ancient rulers in those signs? Thanks very much again!